Blanca With Mechanical Pegs , 650mm . 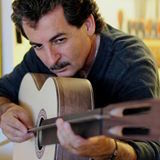 VAHE FLAMENCO / CLASSICAL GUITAR MAKER . That is a nice looking guitar. I like the French Polish. I thought I read somewhere that you also made Ouds. If you do, would you be interested in posting some of your work? I started building and repairing Ouds and violins when i was 11 to 15 years old . i don't do it any more. I learned the french polishing in an early age .